Diabetes in dogs is a complex disease with a lot of variables. Diabetes is caused by either a lack of insulin (Type I) or an inadequate response to insulin (Type II). Insulin is an anti-diuretic hormone whose job is to control the kidney’s absorption of water. Mellitus Diabetes (Type I) is characterized by insulin deficiency. This is the most common form of the disease, which occurs when the pancreas is incapable of producing or secreting adequate levels of insulin. Dogs who have Type I require ongoing, life-long insulin therapy in order to survive. Insipidus Diabetes(Type II) is characterized by an inadequate response to insulin. The following symptoms could be an indication that your dog has diabetes. Note: If your dog shows any of these symptoms it’s important to visit your veterinarian immediately for tests. The management and prevention of dog diabetes starts with a proper diet. For most dogs, insulin injections are necessary for adequate regulation of blood glucose. 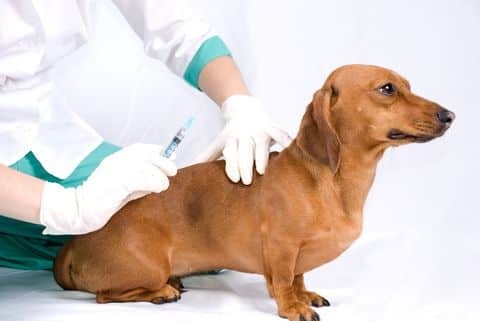 Once your pet’s individual insulin treatment is established, typically based on weight, you’ll be shown how to give him insulin injections at home. Cost to Treat: If your dog requires insulin to treat diabetes you can expect to pay $60 to 100 per month.